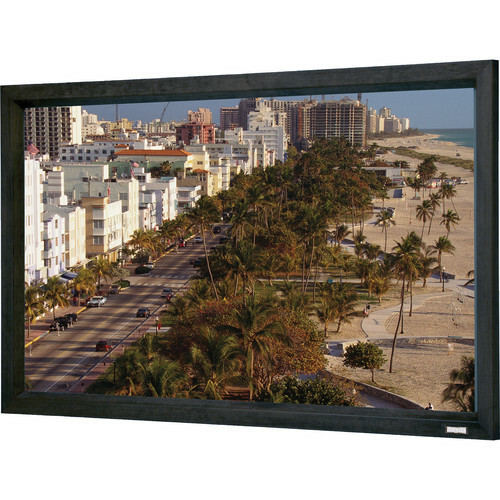 The 70322 Cinema Contour Fixed Frame Screen by Da-Lite has a 72.5 x 116.0" viewing area, 16:10 aspect ratio, and 137" diagonal. The Pearlescent surface has a 1.5 gain, 80° viewing angle, and offers a higher amount of reflectivity than the Da-Mat surface. It is designed for use in applications where moderate viewing angles are required. This seamless surface is a good choice when producing video images with a lower-output projector or where there is a high amount of ambient light present. Pearlescent can be cleaned with mild soap and water, and is flame-retardant and mildew-resistant. This surface has also achieved GREENGUARD GOLD Certification. Black backing on the back of the viewing surface prevents light bleed-through. Box Dimensions (LxWxH) 130.0 x 9.0 x 8.0"